IT takes a movie like Danny Boyle's 127 Hours to open our eyes to just how integral the right director is to a story, and to developing it for the big screen. Essentially, Boyle (Slumdog Millionaire, 28 Days Later) takes a true story that easily could have burnt out half way through, and converts it into a visionary chronicle, pierced by the enticing and peculiar score of Oscar winner A.R. Rahman (Slumdog Millionaire). That true story belongs to mountain climber (& now public speaker) Aron Ralston, who spent...wait for it...127 hours pinned by a boulder against a canyon wall in Utah's Blue John Canyon, in 2003. Ralston spent the next five days drinking his own urine, videotaping his goodbyes, and drifting in and out of delusion, until he realized his last resort. His exhaustive trial climaxed when Ralston, now 35, pulled out his dull pocket knife and amputated his own arm. Even then, on the brink of freedom, the severely dehydrated and dazed Ralston still had to trek across miles of isolated canyon landscape to get to his truck. Fortunately, a Dutch family crossed his path and contacted authorities. 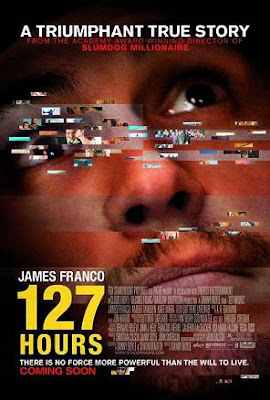 James Franco (Milk, Pineapple Express) is also fundamental to 127 Hours, or at least his career-crowning portrayal of Ralston is. Franco, who's name has already been tossed around for a 2011 Oscar for his performance, summoned vacant despair, imminent delirium, intense endurance, and--though cloaked by the verge of insanity--tenuous bliss, all in a stretch of 90+ minutes. Not bad for a guy who recently played a stoner and the Green Goblin...not in the same movie, of course. Although I, or anybody else for that matter, was not there with Ralston in that crack of canyon, I can only assume Franco nailed the climber's revolving and unimaginable emotions as he pleaded with God himself, as he reminisced about the time spent with family and friends, and as he recorded his current conditions at intervals. And it was that look on Franco's worn face when he sliced through the final bits of flesh and tendon to set himself free that lent a stark realism to what had just happened. To how Ralston must have felt. Those final 10 minutes of the film are enough to evoke tears from its audience, as Boyle taunts our tear ducts with images of sheer joy, therefore reminding us of the scope of human potential, our inherent dexterity, and our will to survive any ordeal. All wrapped up with, again, Rahman's serene score. 127 Hours goes to show that, with the right person at the helm, any story can be told on film, in a way that is both visually stimulating and emotionally intoxicating. Despite a brief period of myself denying Boyle's capability of stretching this narrow plotline--especially after watching Rodrigo Cortes' draining and dismal Buried--this movie delivered on its own buzz. Then again, I shouldn't have expected anything less from Boyle.